Swimming pools are the main source of fun and relaxation when it’s time to cool off from the hot summer sun. 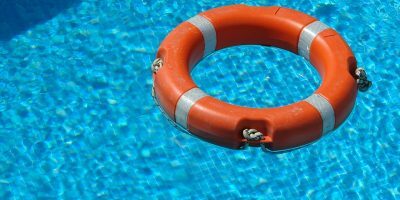 Many people want an above ground pool that will last them several summers, but they often don’t know where to start looking. With this, you should consider looking into Intex pools, which is one of the most popular pool brands on the market. 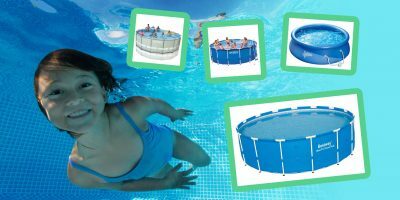 We have written a separate, in-depth review of the Intex Easy Set Round Pool. Easy Set pools give you the option of having a pool for the whole family without all the frustrations, commitments, and expensive costs of a permanent in-ground pool. They are fairly easy and quick to set up since all you have to do is pick a flat surface, inflate the top ring, then fill it up with water. 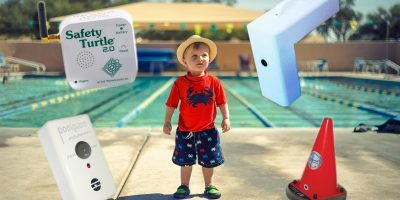 The Easy Set model is an ideal and affordable starter pool for young children, but also come in sizes that fit teenagers and adults. Sizes start from 8ft x 30in all the way up to 24ft x 52in. The price ranges from as low as $50 up to $300 depending on size, and Easy Set pools typically come with a pump. The Intex Easy Set Round Pool Set is a recommended model that’s great for both adults and kids. With a provided 330 GPH filtration pump and Super-ToughTM plastic material for high damage-resistance, it’s ready for water in as little as 10 minutes and has a capacity of 639 gallons when 80% full. We have written a separate, in-depth review of the Intex Metal Frame Pool. The metal frame pool acts as an upgrade from the Easy Set model due to the galvanized steel rust-proof frame which makes the structure much more durable and sturdy. The snap-on joints that are provided make assembly a breeze, and for extra strength, the triple-strong laminated sidewalls are made of 3 separate layers of material. Assembly includes laying out and constructing the frame, configuring the water pump, and finally filling it with water. The smallest size is 10ft x 30in and the biggest is 24ft x 52in. You can expect to spend around $100 all the way up to $1,500 based on factors such as size and depth. The Intex Metal Frame Pool Set (15ft x 48in) is a popular choice in this category. Its frames are rust-proof and have snap-on joints for easy assembly, not to mention it comes with a 120V 1,000 GPH filter pump. The drain plug accepts a garden hose for convenient draining, and because it’s a set, the pool additionally comes with a ladder, drop cloth, and pool cover. We have written a separate, in-depth review of the Intex Oval Frame Pool. Combined with the flexibility of the Easy Set pool model and the strength of a metal frame pool set, the oval frame pool can be the perfect fit if you have a narrow yard. The sidewalls are made of triple-layered laminated PVC while reinforced with a durable rust-resistant steel frame, and to prevent deterioration in the sun, the outside layer is made with a UV inhibitor. The particular oval shape of the pool allows for lap swimming or leisurely games such as volleyball. Sizes include an 18ft x 10ft x 42in oval pool and a 20ft x 12ft x 48in oval pool, big enough for the whole family to enjoy. The price for one of these pools are roughly around $350 to $600. The Intex Oval Frame Pool Set (18ft x 10ft x 42in) is a great option for its set up is almost effortless with its snap-on joint frames. With a provided 120V filter, ladder, drop cloth, and pool cover, this pool can fit the whole family and has a nifty drain plug for draining water away from the pool area. We have written a separate, in-depth review of the Intex Prism Frame Pool. Prism frame pools offer a lot of the same benefits you would get from Ultra Frame rectangular pools, but with smaller sizes and more affordability. If you don’t have a huge backyard, prism frame pools are a more ideal size and come in rectangular and circle shapes. They also give your yard a fresh new look with its contemporary cool blue/gray color and white trim and add convenience with a built-in drain plug. The frame is made of a sturdy powder-coated steel tubing that’s light but highly durable, and the trimmed liner is made of 3-ply PVC vinyl to prevent punctures and tears. You can choose sizes from a family-sized 16ft x 8ft x 42in pool up to a large 24ft x 52in pool and the price can be around $100 up to $600 depending on size. A good model to look at is the Intex 16ft x 8ft x 42in Rectangular Prism Frame Pool Set, inspired by Intex Ultra frame pools. Its strong powder-coated steel tubing and mosaic tile-printed liner gives it extra durability along with Hydro Aeration Technology being incorporated into the included filter pump for better water clarity and filtration. Typical with any pool set, it additionally comes with a ladder, ground cloth, and cover. We have written a separate, in-depth review of the Intex Ultra Frame Pool. For the best combination in price, quality, and durability, Intex Ultra Frame pools are the prime example. Available in circular and rectangular shapes, these pools are some of the best above-ground pools in the market due to their strong material, sturdiness, and relatively cheap price. In general, these pools are perfect for those looking to make an investment to fill their spacious backyard with a worthy conversation starter. Newly called Ultra XTR Frame Pools, Round Intex Ultra Frame pool sizes range from 14ft x 42in to 22ft x 52in and rectangular pools range from 24in x 12ft x 52in to 32ft x 16ft x 52in. Their prices usually start around $400 and go as high as $1,600 with varying sizes. The ultimate choice is the largest on offer Intex 32ft X 16ft X 52in Ultra XTR Rectangular Pool. It comes with all the works, such as a Krystal Clear filter pump and saltwater system, a ladder, ground cloth, debris cover, deluxe pool maintenance kit, and a bonus volleyball set. 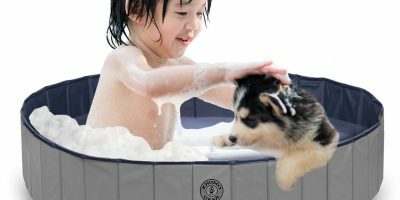 It can be ready for water in 90 minutes, and its laminated PVC sidewalls make the whole structure strong and durable, giving you a peace of mind as you lean back and relax. We have written a separate, in-depth review of the Intex Rainbow Ring Inflatable Play Center. Intex Kids pools are exclusively for young ones that enjoy splashing around and having fun, not to mention they’re made in many different styles, sizes, colors, spray features, and more. All Intex Kids pools are inflatable and come in round, square, rectangular, or more creative shapes. 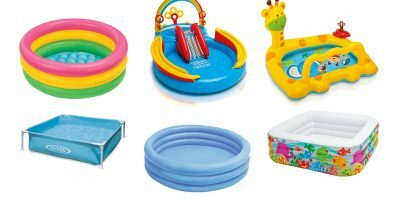 They’re great starter pools for the little ones and are ideal for ages up to 8 years, but can also be just as fun for adults depending on the size. Additionally, these pools will not only keep you cool during the summertime, but when it’s off pool-season, you can use them as ball pits for even more entertainment. Intex Kids pools are relatively affordable, with prices from $30 up to $150. The Intex Rainbow Ring Inflatable Play Center is the most popular of its kind, with fun features such as a water slide, wading pool, water sprayer, a plastic ball roller game, and a ring toss game with 4 inflatable rings. Adults and kids can have fun with this creative pool that can hold up to 77 gallons. With over 40 years of history, Intex pools, airbeds, spas and other items are built to last with safety and fun in mind. Routine tests on their finished products are the company standard to ensure that they meet their requirements for quality, safety, and value. The company makes a great effort to decrease their carbon footprint as well, working with their suppliers for over 10 years to reduce fossil fuel usage. The overall goal of the company is to provide your family with years of happy memories with their products. 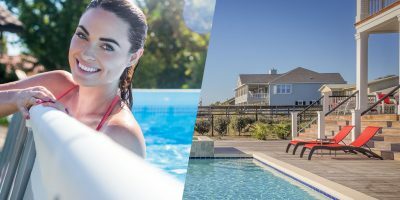 As Intex stands as one of the most popular pool brands to date, many look to their products to find the best option for their summertime cool off sessions. If you have a strict budget and want to set something up quickly with little maintenance, then Easy Set pools would be ideal. For those that don’t mind a bit of effort during assembly and want something more sturdy and spacious, you might like to look at Intex oval, prism, or ultra frame pools. Lastly, if you want something small to start with that the whole family can enjoy, Intex Kids pools come in a large variety.